Check your pantry plus add a few fresh vegetables. 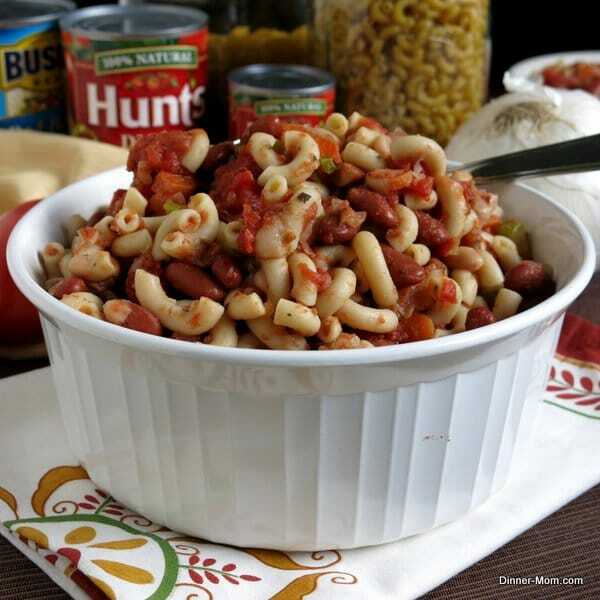 You might just have everything you need to make Pasta Fagioli Soup inspired by the Olive Garden favorite. My pantry is bursting at the seams with good intentions that never happened. So, I’m on a mission to correct the chaos by using the excess in some of my favorite recipes. First up: Pasta Fagioli Soup. The “pantry” part comes from the current state of affairs in my kitchen and because you will find many of the ingredients on your shelves. Add some fresh produce and you have a tasty soup like the one you might enjoy at Olive Garden. It’s okay to bombard you with soup recipes now that fall is approaching…right? I loooove soup all year long. 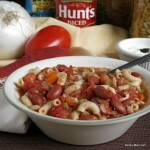 But, this chili-like pasta fagioli soup reminds me of the season to come. It’s a one dish meal and when I make it…I make lots of it. Guess how many batches I have in the freezer? These are my assembly canisters (which are actually suppose to hold serving spoons, spatulas, etc.) 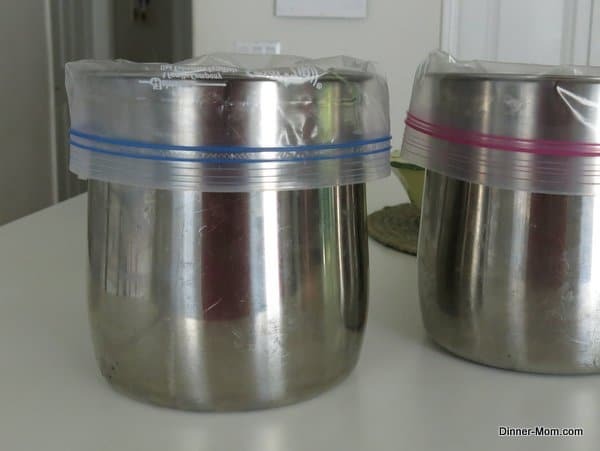 A gallon size freezer bag fits perfectly inside one of these. I fold down the edges of the bag and fill them up, with very little mess. A bowl does the job too. Soften the onions, carrots and celery on the stove top and then divide the ingredients between the various batches once they’ve cooled. You can get away with uncooked veges if you like the extra crunch. If you like a lot of liquid in your pasta fagioli soup, then add a cup of broth or water. I keep 1 and 2 cup bags of cooked ground beef crumbles in the freezer. My hubby likes meat in his soup. I don’t. So, I serve it on the side. It’s an easy compromise. Any short pasta would work in this soup. If you are cleaning out your pantry, get creative! Shells anyone? Ditali pasta is traditionally used. Flatten the soup for easy storage and faster defrosting. 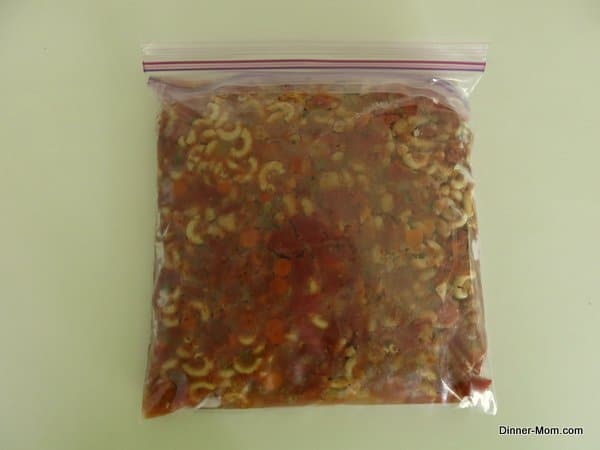 Double bag the soup to avoid any potential leakage when defrosting. Label the bag and date it. You don’t want any mystery items in the freezer! To defrost the soup, either transfer it the refrigerator the night before or defrost it in the microwave and then heat it up on the stove top. It is very comforting to have a big bowl of pasta fagioli soup ready at a moment’s notice. When I think of this soup, I think of Olive Garden, which led to my adaptation of the “top secret” recipe for Olive Garden’s Pasta e Fagioli soup by Todd Wilbur. Check your pantry. You might have most everything you need for this delicious pasta fagioli soup. Prepare ingredients as indicated above. Brown ground beef, cook pasta, cut vegetables, open cans and drain contents. Add onion, celery, carrot and garlic and cook for about 5 minutes or until vegetables are softened. Leave out pasta to keep recipe South Beach Diet Phase 1 Compliant - and yes it is really tasty even without the pasta! *Use the other half of the beans to make a batch for the freezer. While you have everything out, fill up a plastic bag that seals with the ingredients. Or, just double the recipe and freeze the leftovers. Thanks! I had everything for this, and it was really yummy!